As you wander through the charming streets of historic Lyon, you’ll be spoiled for choice over where to eat dinner. But the local bouchons are the city’s best-known culinary delight, promising visitors a dining experience that is authentically aux Lyonnais. 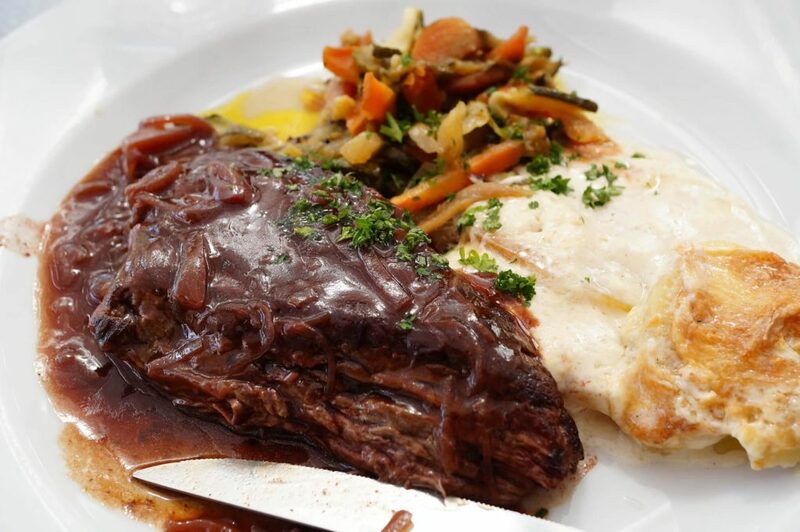 Lyon is renowned for being one of the best gourmet destinations in France and the traditional cuisine is rich and hearty – think dishes rich in pork fat, indulgent pâtés and andouillette sausages. Make sure you arrive hungry, and leave room for cheese and delicious desserts. The name ​‘bouchon‘ is thought to come from a word for a bushel of twisted straw. The same word also refers to a cork in a bottle. Their origins are as small inns that sprang up in Lyon to cater to the demands of local travelling merchants, and they became marked by the straw bundles on their signs. Since 1997, there has been a list of ​‘authentic’ bouchons which proudly display the Les Bouchons Lyonnais label in their window. The logo depicts a traditional marionette, Gnafron, who symbolises the pleasures of good food. You can recognise him by the glass of wine in his hand. With this official status comes success, and it has made proper bouchons ever-more popular with tourists and thus driven up prices – but they’re still a good sight cheaper than other restaurants of the same quality. The award is bestowed every year, leading to a little fluctuation in which bouchons make the cut. There are three locations for this successful group of bouchons – Créqui, Saint-Jean and Crois-Rousse. These are all overseen by Joseph Viola, who has been awarded the coveted accolade of one of the best craftsmen of France, ​‘Meilleur Ouvrier de France’. 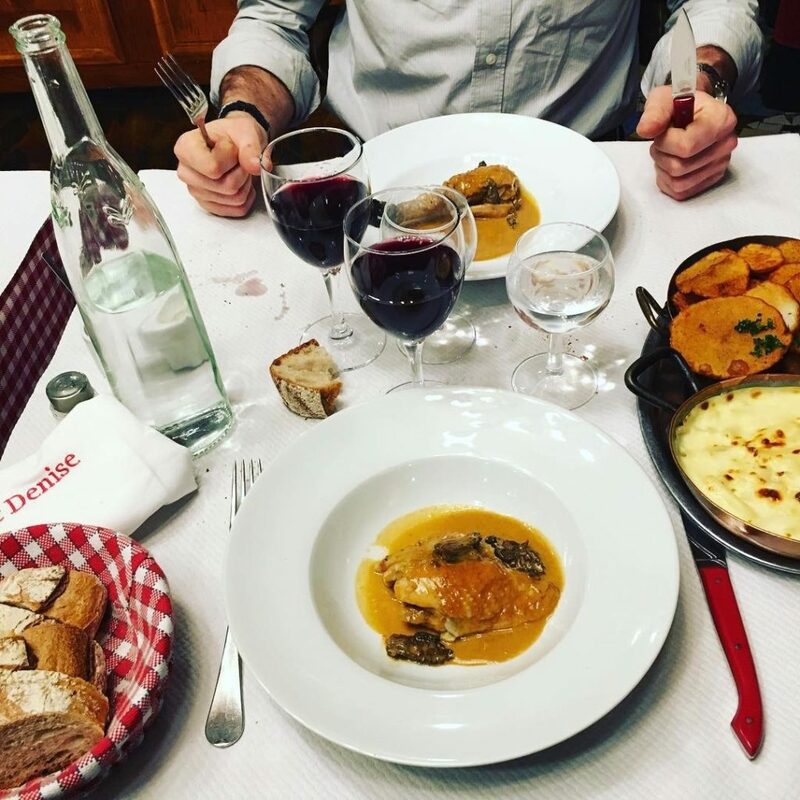 Daniel et Denise is something of a local institution, serving up proper, traditional Lyon dishes made with an expert, artisanal quality. The traditional décor – checked tablecloths, copper pans and tiles – adds to the experience. The warm and welcoming atmosphere of Le Garet Lyon makes you feel right at home in its cosy and cluttered space. It’s located near the Hôtel de Ville (Lyon City Hall) in the central tourist area, but it remains very popular with locals for its rustic food and helpful staff – so make sure to book a reservation in advance. The menu is very traditional, so this is the place to try Lyonnais classics like calf’s head, chitterlings, tripe and dumplings. If you’re looking for a little more variety, L’Acteur is sure to delight you. The dishes on offer change regularly thanks to the daily menus, and the décor is quaint without being kitsch. There’s not much space, so things might get a little cramped, but it’s worth it purely for the chef’s out-of-this-world pastry and pies. Never mind forking out hundreds of euros for a Michelin-starred restaurant in Lyon: the true heart of this city’s gastronomy lies in its authentic, traditional eateries. If you want to see how the Lyonnais live, find them in le bouchon.